OK, OK, so Fate/Extella: Link does have a story but don’t worry if you’re not familiar with the franchise or the previous games in the series – like the last game Fate/Extella: Link can easily be played on a purely hack and slash level, foregoing the complex (yet intriguing) story, should you so wish. Its testament to the developers that you don’t need to follow the story to enjoy the game! You might think that hacking and slashing your way through waves of enemies without context might sound dull, but thanks to the games puzzle-like elements and the limits placed upon you by the ever-present enemies there’s an in-built tension that keeps you constantly on your proverbial toes. Speaking of the Fate franchise, this game picks up right where the 2017 smash hit Fate/Extella: The Umbral Star left off, adding 10 more servants to the original roster of 16 – including characters from other Fate series such Astolfo from Fate/Apocrypha, Scáthach from Fate/Grand Order, and the return of Francis Drake from Fate/Extra. This time round the high-speed action gameplay has been refined, seeing players battle their way through massive invading armies to retake the virtual world of SE.RA.PH from an invading force. You can also move freely around your army’s base camp—a medieval church suspended in the sky. Interact with your Servants to build your bonds and take on side-missions to learn their stories. Plus Fate/Extella: Link allows players on ALL platforms to engage in massive four-on-four online battles with up to seven other players. Like its predecessor, the combat here is pretty simple. There’s no ridiculous key combos, just light and heavy attacks, block, dash and dodge. That’s it. Well I say that’s it, there’s also the enemy wave-destroying maneuvers like Moon Dive and the phenomenal Noble Phantasm, that take down multiple enemies (or all of them in the case of the latter) in one go – and you’ll need them given the sheer amount of enemies, so many in fact that you can easily rack up huge, and I mean satisfyingly huge, kill counts and combos! 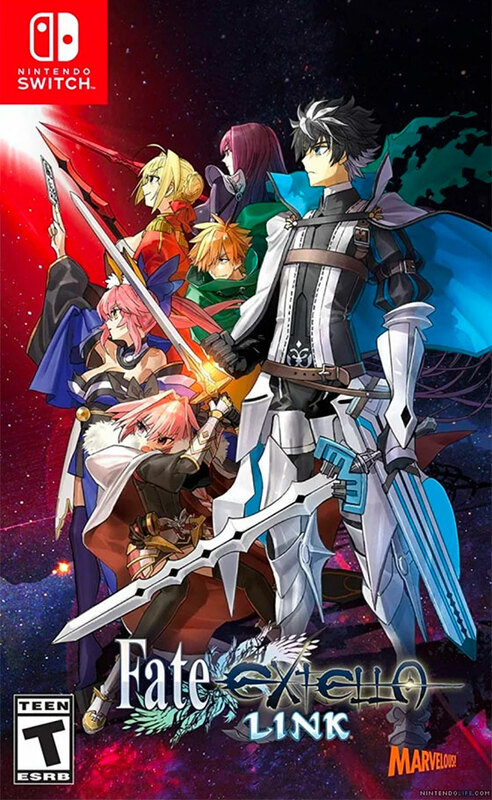 Besides the convoluted story, which you really don’t have to follow to enjoy this game (and given how complex and in-canon it is its probably best you DON’T try and follow it), each level sees you taking control of a Servant to defeat an army of enemies and a “final” boss to take over a sector – sectors which are either controlled by you or the enemy. As with Umbral Star you jump between sectors, conquering each before moving on to the next. Think of it like a hack and slash game of capture the flag, only the “flag” is a sector in this game. There are some sub-missions and other objectives than you are made aware of that will distract you from the main game but it’s still a case of hacking and slashing your way through. Once a Musou game, always a Musou game! Again, like its predecessor, the thing that raises Fate/Extella: Link above it’s competition is it’s speed. This game is fast; much more so than many other Musou titles available on the Switch. The speed at which you battle and generally move around the game adds a real frentic edge to proceedings. For those, like me, that like their hack and slash games to move with pace, this game ticks all the right boxes. If you’re a fan of Musou games, even if you’re not familiar wth the Fate franchise, Fate/Extella: Link is a must-have game, improving on the previous frachise entry in every way, and you should really make it a day one purchase when it’s released on March 22nd.